From the minds that brought you Talk’n POP! 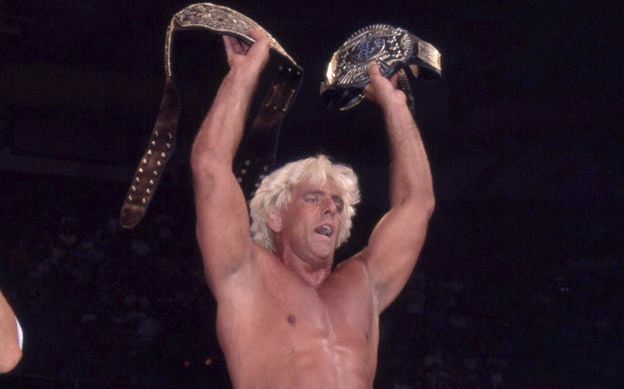 comes Talk’n WCW, a unique look at the talents and matches that built the legacy of World Championship Wrestling. “You did it (twice)! Now … do it again!” The third time’s a charm as Tim Capel, Jennifer Smith and Greg Phillips turn their attention to perhaps WCW’s most famous competitor, the kiss-stealing, wheeling-dealing, limousing-riding, jet-flying son of a gun who kissed all the girls and made ’em cry, “The Nature Boy” Ric Flair! In particular, the gang talks about the legend’s less-heralded decade of the 1990s, discussing bouts from the midst of his backstage war with Jim Herd, his triumphant return as a conquering hero, and his last real blood feud with one of his most heated opponents. Demi Moore haircuts and declarations of “OH, GOD!” fill this edition of Talk’n WCW!